Did you resolve to make improvements to your landing pages this year? Are you looking for copywriting tips to help you get better results? Our copywriting agency clients are right there with you. These marketers and businesses are taking a look at the last twelve months and forming plans for the coming twelve. The first thing on their list is improving conversion rates on their landing pages. Begin by writing down the SINGLE goal for the page – what is the one thing you want people to do on the page? When you identify this goal, write all the copy on the page directing the reader toward that one goal. Only then can you think about 2 more goal options for the page and how these will work together with the main goal. If the visitor doesn’t buy (read, compare, call) today, what else can you offer? Could they sign up to your newsletter? Is there another offer that might be better suited to their interests? Instead of losing them to a ‘back button’ pique their curiosity with more content elsewhere on your site: blog posts, articles, whitepapers, even an interesting comment. Some marketers will tell you to have only on achievable action on a page, but I believe that is poor customer service. For most of the businesses we work with, they find that it’s better for them to move visitors through their sales message across their site than to give them no other option but ‘escape’ or ‘convert’ on a landing page. Sometimes our web developers and designers are in a rush and they drop in buttons and calls-to-action that DO the action, but don’t tell the visitor what to expect. Web copywriters rewrite buttons, link text, ad copy, and calls-to-action to support the page goal from number 1 and to remind the reader what action they are performing. This helps conversion and it’s good usability. The usual newsletter sign up button saying ‘submit’ focusses on the technology of the form, not on what the person is doing (or wants to do). Instead, we write actions like ‘sign up’ or ‘register’ or ‘subscribe’ depending on the context to support the visitor’s understanding of the intent. I don’t like submitting to anyone, but I often register for content or subscribe to mailing lists. We’re a copywriting agency and we often are asked to review, write or rewrite SEO copywriting for our clients’ landing pages. This is either because they have a new SEO programme they are implementing, or they are improving or amending their keyword selection. With the Google updates of last year, SEO copywriting is now (thankfully) about quality content, not ‘keyword stuffing’ so you need to understand the SEO side and the composition side of copywriting to do this the right way. 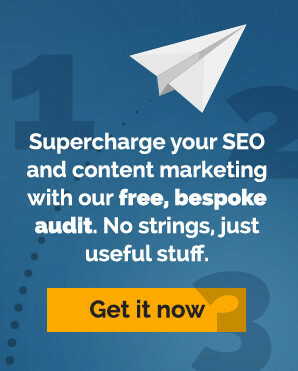 What are your favourite copywriting tips for landing pages?